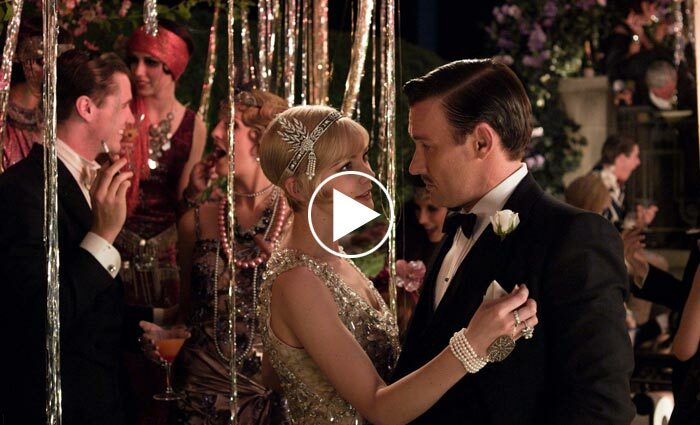 Warner Bros. Pictures has released the third movie trailer and new poster for Baz Luhrmann’s 3D film adaptation of The Great Gatsby, based on F. Scott Fitzgerald’s iconic novel. The new trailer features the songs “Back To Black,” from Beyoncé x André 3000; “Young And Beautiful,” from Lana Del Rey; and “Over The Love,” from Florence + The Machine. The romantic drama stars Leonardo DiCaprio, Tobey Maguire, Carey Mulligan, Joel Edgerton, Isla Fisher, Jason Clarke and Amitabh Bachchan. The story revolves around Midwesterner Nick Carraway (Maguire) who is lured into Jay Gatsby’s (DiCaprio) lavish world. Soon enough, Carraway will see through the cracks of Gatsby’s nouveau riche existence, where obsession, madness, and tragedy await. The Great Gatsby is due in 3D and select 2D theaters on May 10, 2013. Click the image below to view the movie trailer.